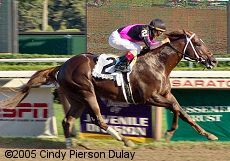 Note: He won the Hopeful and Champagne Stakes with his only loss a third place finish in the Breeders' Cup Juvenile. Finished second in the slop in the Hutcheson Stakes for his first start this year. Finished second in the Fountain of Youth but was moved up to first when Corinthian was disqualified to third for drifting out in the stretch and interfering with both First Samurai and Flashy Bull. Faded badly to 5th in the Blue Grass for his final prep, but was later diagnosed with 2 broken ribs during a rough start in that race where he hit the gate.